Best dentist award in the city of Fort Lauderdale. Unlike the average dentist in Fort Lauderdale, we have pioneered sedation dentistry with advanced minimal invasive laser techniques for a fast recovery in certain clinical cases. We specialize in sedation and providing an anxiety-free visit with twilight sedation and general anesthesia. We take all major dental insurance and offer payment plans options for your convenience. 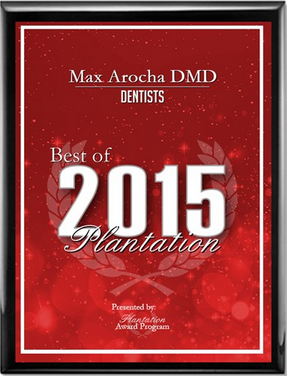 Dr. Max Arocha was selected as one of "America's Best Dentists"! This honor places us among the Fort Lauderdale most respected dentists. Dr. Max Arocha holds hopital previleges at Memorial Regional Hospital. He is a prolific innovator and awarded of U.S. and international patents in the field of sedation medicine and anesthesia delivery techniques. Award-winning Fort Lauderdale Dentist, Dr. Max Arocha is a trained and knowledgeable dentist with more than 10 years of experience in his field. With thousands of hours of advanced training in dental specialties, including cosmetic dentistry and implant dentistry, he has established a world-class dental office in beautiful Fort Lauderdale, Florida. Dr. Arocha provides a full range of dental services. As one of the top dentist in Fort Lauderdale, he realizes patients want a comprehensive dental practice that can handle their needs from routine teeth cleaning to the most complex dental implants. When you come to see Fort Lauderdale Dentists, Dr. Arocha and Dr. Jaquez, about your dental care, you won't get a "one size fits all" dental treatment plan. Dr. Arocha and Dr. Jaquez understand that each patient is unique and that everyone has a different set of concerns, priorities, and needs when it comes to having a better smile. Taking his unique approach to each patient, Dr. Arocha and Dr. Jaquez have changed the smiles and lives of many of their patients. With years of producing beautiful results, Dr. Arocha and Dr. Jaquez have become renowned as the best local dentists Fort Lauderdale has to offer.